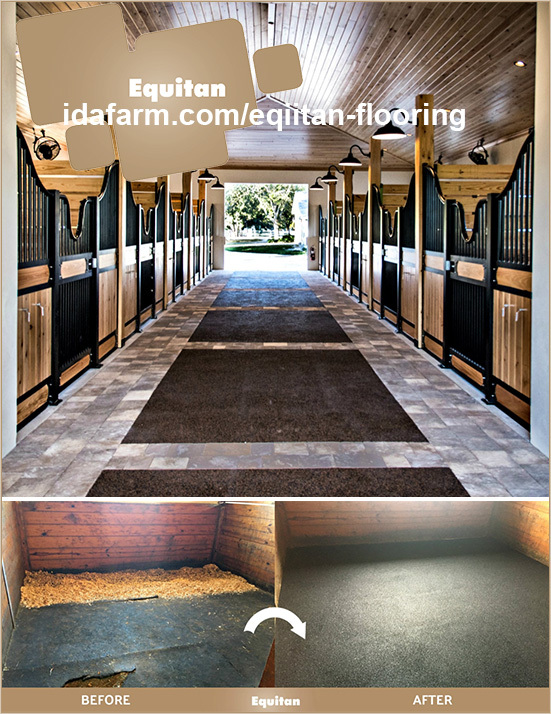 There simply is not an equal to Equitan Multipurpose Flooring, which is why so many leading stables insist on Equitan! IDA Development is founded and operated by active horsemen and woman who understand what it takes to care for horses and run a successful stable. Dissatisfied with anything less than the best, they sought out and found the best, most attractive, long lasting, easy to maintain and visually gorgeous flooring and footing products. Through extensive research into the finest solutions for horses and their owners, they are now proud to be the exclusive distributor in North and South America of Equitan Multipurpose Flooring and Equitan Footing products. IDA Farm is based in Wellington, Florida, the Equestrian Capital of the World. People travel worldwide with their horses to partake in the Winter Equestrian Festival and Adequan Global Dressage Festival. Many top riders and coaches who travel to Wellington stay at IDA year after year! They are located within a 15 minute drive to all showgrounds. Sitting on 22.5 acres, there are 6 barns with 130 stalls, 36 paddocks, one all-weather outdoor regulation dressage arena with mirrors, 100’x200’ all-weather jumping arena, 70’x200’ covered arena with dressage mirrors, 85’x200’ covered arena, multi-purpose 130’x250’ all-weather outdoor arena, 3 round pens and an exercise track with a training hill. All arenas and the exercise track are equipped with all weather footing. In addition to our equestrian facility featuring the world-reknowned Equitan Flooring, we have 4 tiki huts where clients can gather together and socialize. Equitan has changed the industry for arena footing and multi purpose flooring systems with their state-of-the-art rubber based technology. Equitan is a corporative product of APT and Melos. Melos and Advanced Polymer Technology (APT) are members of the SportGroup. They are global manufacturers of granules and polyurethane-based material. From Olympic stadiums to your own backyard, Melos and APT provides people around the world with safe, reliable, high performance athletic surfaces and protective coatings. What Sets Equitan Apart From Stall Mats? Equitan Multipurpose Flooring is so different, so superior, such an improvement over stall mats, that you will wonder why anyone would ever use anything else! What Sets Equitan Apart From Rubber Floor Pavers? Equitan Multipurpose Flooring is so different, so superior, such an improvement over rubber pavers— with all their nooks and crannies that can fill with dirt and debris, that you will wonder why anyone would ever use anything else! What About Equitan vs “Pour In Place” Flooring? Will Equitan Help With Installation? IDA Development has certified installers that are specially trained to install Equitan Flooring. When you see the barns, show stables and show facilities that have Equitan Flooring in use— it is a gorgeous sight to behold. You will love it. Is Equitan Flooring Easy to Maintain? Equitan Multipurpose Flooring is superior in many ways, but one of the greatest is it’s ability to be easily be cleaned with water or for dry areas swept with broom or blower. You will love that there are NO “nooks or crannies” to hold the dirt, hay, manure or debris! Absolutely! Equitan was designed to hold up to the rigors of horses or other livestock you may have in your barn. Equitan is extremely durable and does not breakdown from the sun. It comes with a full 3 Year Warranty! What If I Also Need Superior Footing For My Arena? We have it. Our Equitan Footing is just as superior and amazing as our flooring, which is why leading stables insist on Equitan! Equitan Arena Footing, exclusively distributed by IDA Development, offers ideal conditions for effective training for your horses. With the perfect balance of surface elasticity and stability, it can help support tendons, back and joints. Weather resistant, and low, long term maintenance— it stays consistent in all temperatures and high traffic conditions. Another great thing about this footing is that it can be self-installed without the use of heavy machinery or a contractor. That is easy. Just pick up the phone! We are happy to answer all your questions and make the purchase and installation of your gorgeous Equitan Flooring a pleasure from start to finish. You’ll love the “oohs” and “aaahs” that come from trainers, judges and horse people that come by and see this amazing flooring. Your horses will love the comfort and no one ever complains about the property value INCREASE that comes with Equitan Flooring. Call us today and we are happy to make your flooring dreams come true!